Language is what separates us from other species; it’s the reason we became a collaborative society, and henceforth established ourselves ahead of any other species in the department of innovation. With innovation came tools and revolutions, the most influential tool we were able to create was the computer. Computers had an impact on almost everything, be it calculations or social interaction, and has now cemented its position as the core of the modern society. Programmable machines came as early as the 9th century when the brothers Musa described the automatic flute player. The industrial revolution also brought interesting algorithms to program machinery, and the process of progression in language was initiated. A programming language is a medium through which a set of instructions can be delivered to the desired output. It’s a medium for human and machine interaction, an idea that transformed the ages to come. The invention of computers brought a great deal of complexity as they were programmed in binary, 0 and 1. Instructions through binary, assembly, language were a tough task; an IBM worker, John Backus, came up with the first high-level language in 1954 and named it FORTRAN. This set into motion the development of similar high-level languages, all for the common goal of decreasing the abstraction for easier communication with the computer. 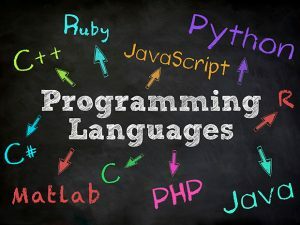 This article is to make you aware of the current trend in programming languages, which language is in demand and how does know a programming language affect your prospects. Try reading this article without the lens of a nerdophobe, the knowledge of programming languages is as, if not more, important than knowing any other language; that is to say the world has progressed so much that computers are integral to our society, computer languages are the medium for you to be a part of the trend in technology. This language was created centered around the philosophy of readability, this set a tone for it to become a general purpose language. It was created in 1991 by Guido van Rossum. It is a syntax that allows programmers to express concepts, or give commands, in fewer lines of code relative to C++ and Java; this is primarily due to the readability and easy to understand the feature of the language. This language features an easy to manipulate and design system, where due to the dynamic nature a lot of program paradigms are supported like it being object-oriented, imperative, procedural, and functional. It also supports automatic memory management. Other than the features, this language is designed for novices and beginners. The beginner-friendly nature of Python may have raised a few eyebrows regarding its application. Among many technologies, Python has played a vital role in the formation of Instagram, YouTube, and Reddit. PHP is a derivative of the language it was written in, C. This makes PHP inherit some of C’s perks. Its creation was aimed to make and design web applications, e.g., Facebook. The difficulty level might have given away the user-friendly nature of this language. Learning it would mean you’ll have enough tools to implement your creative website ideas. The web is filled with hundreds of millions websites based on this language, the popularity of the language regarding its versatility and ease in use has aided to these numbers. Ruby was introduced to the world around the same time as Python. Unfortunately, it didn’t gain popularity until very recently. The thing that made Ruby a sensation in the programming community were its rails framework; this development made web development extremely intuitive. Like black coffee, Ruby isn’t for everyone. The difficulty of Ruby is similar to Python; so you’re encouraged to try it out and see if it’s the paintbrush for your canvass. If in case it is to be your forte, then you will have a general purpose language with a vast scope. From security tools to social websites, Ruby’s rails framework has left traces all over. Metasploit and Twitter are two examples that make evident the diversity of this language. Don’t confuse it with Java, originally called ECMAScript it was renamed in the pursuit of attracting more people through the popularity of Java. It is an essential tool for frontend web design. This script is the reason for the well-knit web pages on the internet. It’s a perfectionist’s language. The script allows you to pull strings and make your web page more interactive. So if you aim to be a creative designer for websites, then this is a must learn. Frameworks have been developed to allow it for backend software programming. It is the Pink Floyd of programming languages, made in the 1970’s it was aimed to implement procedures using as little memory as possible. Most of our modern languages have been influenced directly by C. The list includes; C++, Python, and Java. C can act as an excellent base to learn multiple languages, if you aim to diversify your skill set by learning multiple languages then starting with C will be a wise decision. It may be comforting to know that starting with C may steepen your learning curve. C was designed to be a powerful language; this was so that you can have total control over your software. This innate nature of C has made it the backbone of the world’s most popular operating systems, such as; Windows and Linux. You will also find traces of C in almost every computerized device. A relatively new language, it was developed as a general-purpose language. It’s a part of the Microsoft’s.Net family and is used in collaboration with many other languages to work on big projects. C# can also be used to develop software and applications on Microsoft. It’s gaining popularity every year. Even though it may not be compatible non-Windows formats, C# is a wise choice to develop Windows-specific applications and software. Most of Microsoft’s products are based on C#. So it allows you to streamline yourself instead of Windows software and applications. Java is that one constant in a programmer’s life, so no surprises that it can often be confused with coffee. The language has been around since the 1990’s and is an open source, free to use for the masses. The compatibility of Java with almost every format has aided its popularity and usage. The popularity of Java knows no bounds, it has been in demand since its inception. It is the language of Entrepreneurs, hence making it a must know for anyone who aims to use a computer as a tool to progress. This common language is easy to learn and is a smart investment if your goals are to create your software. Most of the popular Android games are written in Java, e.g., Temple Run. Large-scale applications include the usage of the language in proprietary business software. As C# was introduced by Microsoft, Objective-C was developed and released by Apple. It is the effectively the language for software to be developed for Apple products. The language itself isn’t a hard to learn, as can be seen, by the difficulty scale it’s relatively as easy as Java. The compatibility of this language is only with Apple products. Like C#, this language is a must learn if you opt to streamline yourself for Apple products. This is also enforced by the fact that it is under the ownership of Apple. Either all Apple product applications are running or are developed on Objective-C. Your Apple product depends on this language to run smoothly. SQL, in contrast to Python, is a special purpose programming language. The language, like Arabic, comes with many dialects however if you have grasp over one, picking up the others isn’t an uphill task. Most of the database systems that keep departments organized use SQL. The language runs as a medium to help the user retrieve required information from their specified database. It’s a tough language to learn, and the difficulty rating we have given it is justified. Proficiency in C++ may be a difficult task, but on the bright side, it makes the learning of other languages intuitively easier. As the name suggests, C++ is C with extra features. The one thing that does differentiate the both of them quite substantially is that C++ is a high-level, thus less abstract than C; this makes it a user-friendly general purpose language. All around the globe, the most basic academic courses regarding Computer programming tend to teach C++ to beginners. This is usually to give you a better growth curve, as you’ll be learning the comparatively most difficult language in your initial stages. C++ has object-oriented programming which makes it easier to streamline your work in lieu of using C in which this work would be quite difficult. If you plan on doing major software projects, C++ maybe your perfect toolkit. The language won’t over complicate your work and hence save a lot of time. Fifa and Call of Duty are few of the big names developed in this language. It is one of the most in-demand languages in the media sector. The language’s effectiveness has also made it being customarily used by Wall Street firms to write high-frequency trading and accounting algorithms. As you have seen in the above list of languages, there’s no creative or IT related department that is devoid of programming. The work of these departments has become integral to the firms; this intuitively is due to the competitive market that exists. The nature of the job is such that you’ll find recruiters desperate for people who are proficient in a certain programming language. As an individual who aims for high economic growth and financial independence, it may be sensible to learn a computing language as the demand for such professionals is on the constant rise. If you want to be independent and be your boss, there’s little you can achieve without the knowledge of at least one programming language. Knowing a programming language sends a really strong message, it states your innovative, independent and self-sufficient nature; in the sense that you can provide intelligent solutions and apply your trade for a firm or start your own work. In the economy of today and the turn, we’re taking towards smart systems; it’s wise to be proficient in a programming language. This proficiency makes you in-charge of the status quo. Additionally, to fulfill any IT job-related goals, you need to be proficient in the demanded language. This pre-requisite isn’t a folkway anymore; it’s a norm that you must comply on as it is logically fruitful and provides pathways for a whole set of opportunity. So, keeping in mind your future aims and ambitions, if you feel your creative talent need a modern tool or you want a secure livelihood, invest your time in learning a language.